This is what I've been doing since August. If you're interested in winning one, scroll down to bottom and leave a comment with your name and which piece is your favorite. When my display ends toward the end of May, I'll draw a name out of a hat and the winner will take home the piece he/she listed. All eight of these pieces are slated to be on display at Starbucks, 5351 Lyndale Avenue in Minneapolis starting May 12. While I'm no photographer, I've done my best to capture and explain everything that went into making these works; I honestly had a wonderful time doing each and every one (and am kind of sad that I'm done). Enjoy! This was two stitched images, the stag and the border design, backed onto felt and then attached to a yellow fabric that seemed royal and golden, but masculine enough for the war-seasoned Baratheon brothers. 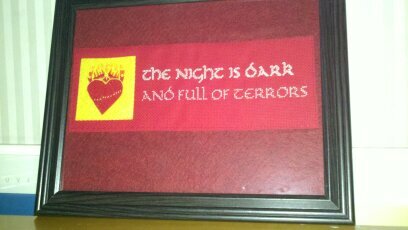 One of the most fun to create, although I had to do all the golden negative space first, before the stag, as no place in seven hells carries gold cross stitch fabric. A few times I found myself actually sewing parts of the stag (in golden) instead, and had to rip it all out and start all over again. The crown around the neck proved too difficult to measure and reproduce for me, so I left it out. The antlers were my favorite, and turned out nice and tight. 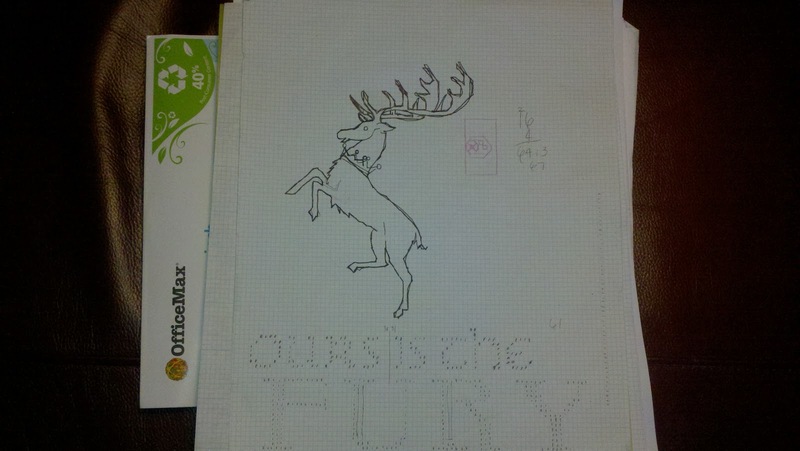 This was before I got it into a frame, but you get the general idea. My first piece in the series, my longest, and probably most difficult, too. You see, I don't really plan much when I start these things, I trace or draw the main image, in this case the direwolf, and then after I finish, decide if it still needs something. This one was an impressive image, to be sure, but it still needed something to make it killer. 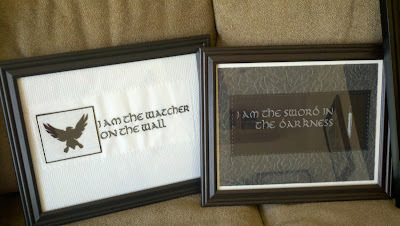 I found the border on a cross stitch site and thought I'd add it either across the top or down the left or right side; little did I know I'd be fumbling around with that damned thing the entire way across, counting, re-counting, and redoing nearly every square pattern I started. I'm not a numbers girl, more of a spatial relationships girl, so having to rely on exactness was difficult. I was lucky not to have run out of fabric, to tell the truth. But I love this one; it's a labor of love that turned out amazing. 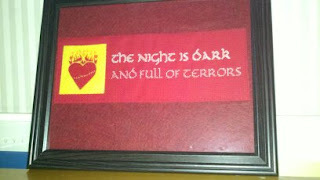 When people ask me if I sell the stuff I make, this piece is a perfect example of why I don't and probably never will. No one will ever love it like I do, and there isn't a possible price that I could put on it that would reflect all the time and energy it took me (which is about four month's worth). Starks are my favorite, btw. If you've read anything else on this blog you know that scowling men are my thing. Lord Eddard felt very right to me for this reason. Jon Snow wins, too, but more on him during The Night's Watch pieces below. 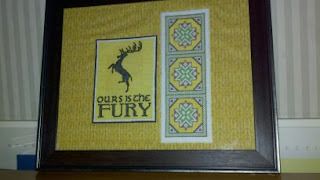 This is the only piece that doesn't have a border, a mat, or any contrasting images or fabric along with it. The three-headed dragon is strong enough on its own, I think. My only regret is that I didn't try it in an oval or circular frame. I suppose I could always do another one; the pattern I drew out for this one was probably the most exact of any of them. 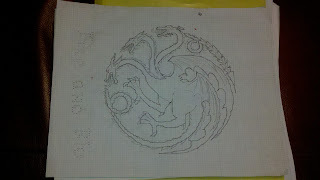 I was ready to write the Targaryens off completely just until that little turnaround last week (Now His Watch Has Ended). . . I love it when there gets to be dracarys. This one was the perfect mix of image, border, and text. It went fast and was exciting to create. It's one of the few that I counted and mapped out before starting just to make certain that everything would be centered. 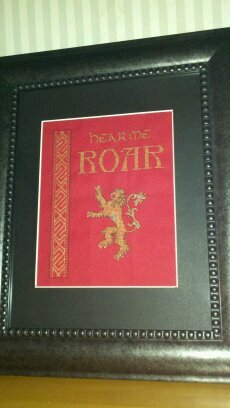 I was worried that the lion might come out a little blunt or dull since I didn't vary the gold too much, but after the black back-stitching went in, it all came together. 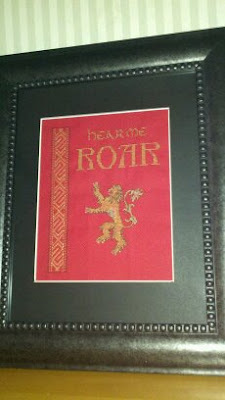 The most dysfunctional family in all the realm, I find House Lannister the most interesting. If you've read the books you know that a lot changes for them, too. Some of my favorite sections of writing and character development come from Jamie Lannister's journey with Brienne of Tarth. As true and wonderful as the show is, reading the events in prose is almost better. If you haven't done this yet, I highly recommend you do it. These were originally going to be one piece; half black and half white, but they seemed to hold up on their own so I kept them separate. 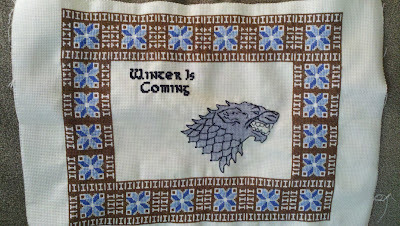 Eventually I'd like to do the entire vow of The Night's Watch, but I'll save that for next winter, perhaps. The sword is embroidered in silver, black, and gray; the crow is black felt. Speaking of crows, the only one I like better than Jon Snow is his Lord Commander, Jeor Mormont (The Old Bear, and father to my boy Ser Jorah Mormont). Also Benjen Stark. What kind of name is Benjen? Okay, what kind of name is Jeor, too, but damn. What do they call the girls that hang around the club in SOA, Crow-Eaters? The men of The Night's Watch scowl a lot, to be sure. I'm with them. 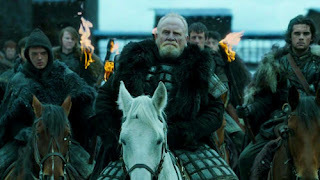 This was one of my favorite images from the show; the gate rises and The Old Bear leads the crows on a white horse with their torches in search of, well, the worst thing imaginable. Powerful example of storytelling with images. I thought the Red Woman should be represented, mostly because I like the sigil Stannis Baratheon adopted on her behalf. 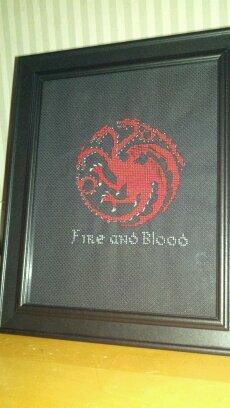 And the more I watch, the more I like Stannis, plus I needed something else that was red. The heart is cut of felt and the flames embroidered; I was nervous about this one looking choppy or amateuristic, kind of like a bad tribal tattoo or something, but in the end I came to like how it came together. I couldn't fit this one in, not all the way. The only piece that I actually used a pattern for (credit to BlackLupin on DeviantArt), this one killed my eyes with its 22count fabric, which was the only stuff tight enough for me to fit all nine houses onto. It was fun, it was lengthy, but it was varied enough to keep me interested since there was always another house to start when I finished. 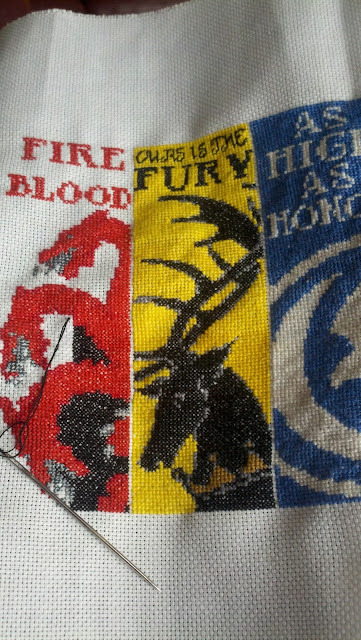 I started in the middle with The Stark's Direwolf and then worked outward. There's a little, well no, LARGE, error on The Greyjoy's Kraken--I had the pattern turned upside down for some reason when I had it with me at my mother's for Christmas. Somehow I picked it up again and turned it rightside up and had no idea I was doing anything wrong and went about my merry way until I finally noticed that the pattern had only one set of curly tentacles, not two. I suppose this is why I don't like being held to patterns, with free-styling on the fly this sort of thing never happens. Also, I probably shouldn't have picked it up after that much wine. 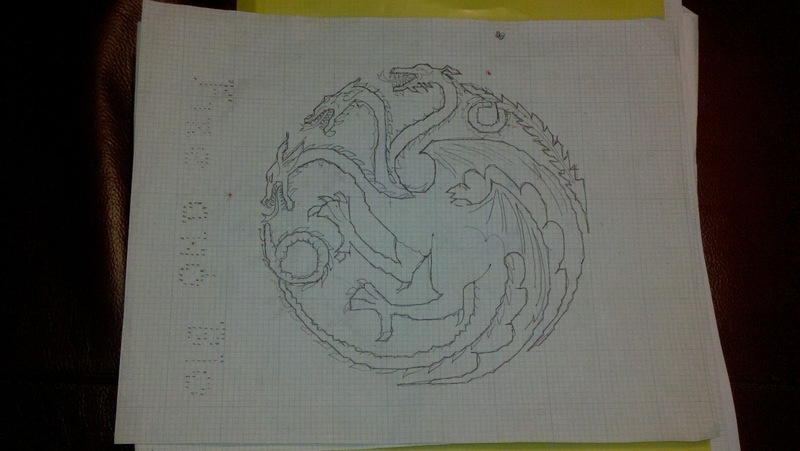 Lessons learned, and the Greyjoys are awful, anyway. If you like what you see, tell me! Leave your name in the comments below along with which piece is your favorite. 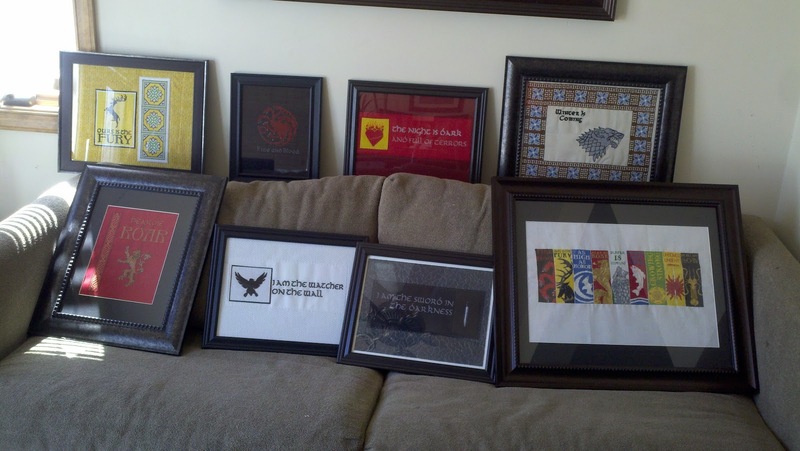 If you want to talk about the show or the books, that's great, too! Should you be on Facebook, Google+, or Twitter and want to share this, please feel free. I'll have a drawing the night I take everything down and I'll announce the winner as a comment on this post and on Facebook, so check back! Thanks for your interest in my art! Love all the cross stitches but the Stark/wolf one and the Dragons are my favorites. Hey, Natalie . . . GUESS WHAT? since you and my mother in law were the only ones who actually followed directions, winner-winner-chicken-dinner! I am actually in the process of reframing the Direwolf to give it more of a margin, but both Night's Watch pieces are yours if you want them! I'll try to work on a few more houses for next year's premiere and do this all again. If you want to text me or call me I can arrange to give them to you. Thanks for playing! Hi, i love these. 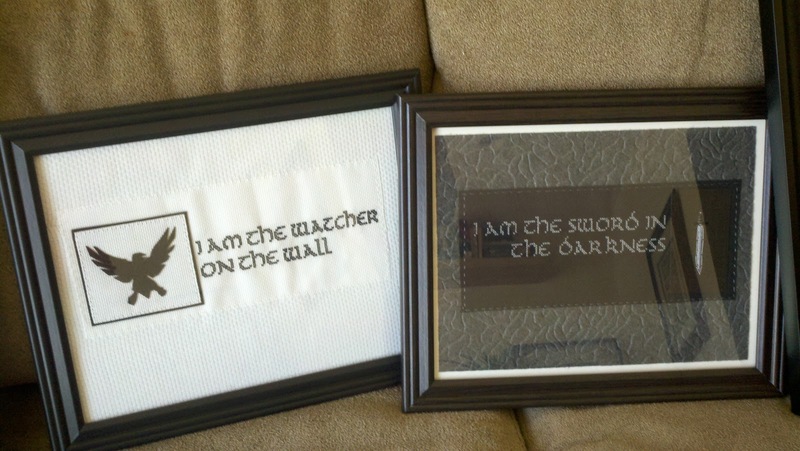 I'm a stitcher myself. Any chance i could have the patterns, would be willing to pay!